The notion of a Carlton pub would probably make most think of a designer interior, a too-cool-for-school drinks list and clientele to match. The Astor Hotel could hardly be more central to Carlton - tram passengers certainly get ample time to look at it during the interminable wait to woggle around to/from Melbourne Uni - but it certainly doesn't fit the Carlton mould. Inside, it's a country pub, a place where locals sit at the bar and use everyone's names as they chat to each other and the staff. (Sitting at the bar does in fact take some getting used to, since the bar stools are incredibly high). The drinks list comes in a plastic sleeve and makes no pretensions to be anything other than serviceable. Counter meals are available, in addition to a bistro-restaurant at the back of the pub offering a commendable array of dishes in the $15-20 range. On Tuesdays the bar menu is unmissable: $10 steak and pot or, even more affordable, $6.50 for a Percy Burger. It's great value. The pattie is solid and genuinely mincey. The tomato is fresh and holds its form. The cheese clearly comes from a cow, not a plastics factory and the bread is toasted on the inside, soft on the outside, as it should be on a burger. 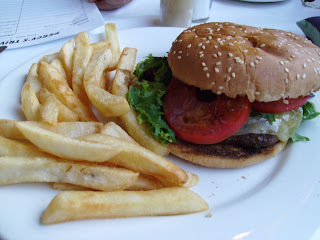 It's definitely a pub burger, but it's not overly-salty nor too heavy. In the background of the shot is the answer form for Percys Trivia: if you don't have occasion to exercise your body after polishing off the chips at least give your mind a workout and take it to the Melbourne Uni academics who come as regulars!